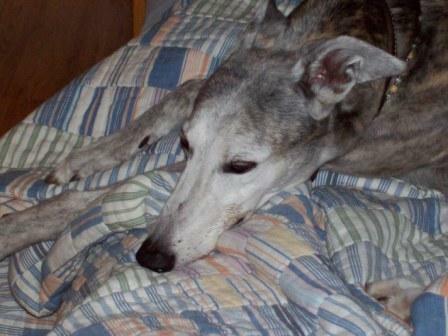 Harmony, a 9-year-young ex-racer, knows how to make herself comfortable. She raced for about two years in Colorado and ended up in Tucson, perhaps traveling with an organization like Greyhound Support Transport. Harmie has lived with Cynthia, one of the Beading Divas, for six years and enjoys visiting with the beaders when they gather at her house. She has a 100-watt unforgettable smile and loves retirement life. In her spare time or when nobody is paying much attention, she shreds toilet paper rolls for merriment sake. For the month of April, all bracelet proceeds will be donated to Greyhound Support Transport of Florida. This non-profit organization works hard to move Florida’s excess of retired racing dogs to adoption groups in non-racing states. Buy bracelets online via Lizzie Stardust on Etsy.com or at Silver Sea Jewelry & Gifts in Tucson located at 330 N. 4th Avenue, 520-624-9954.